*Due to Naga’s presence and the break in the serialization of the ongoing, "Fox Trap!" and "A Perfect Evening" have to take place somewhere between TMNT Adventures #50 and TMNT Adventures #55. Personally, I just place them after TMNT Adventures #52. *Due to the lack of Ninjara, "Zen Million Years to Birth" has to take place before TMNT Adventures #28. Personally, I like to place it between TMNT Adventures #4 and TMNT Adventures #5. I do this mostly because April sits the whole battle out, indicating she hasn’t undergone her training from Splinter yet, which was first mentioned in TMNT Adventures #23. 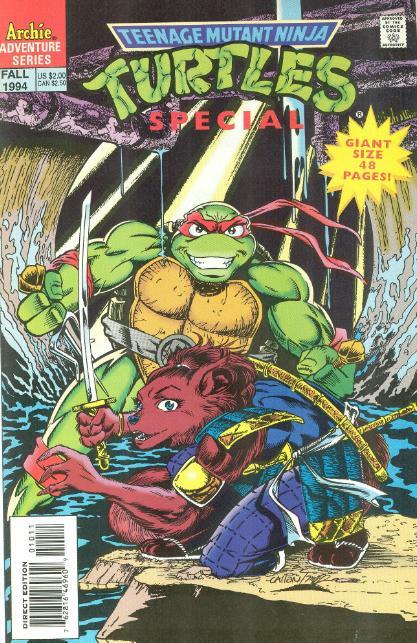 I also place it there because the plot of Splinter teaching the Turtles rudimentary lessons in martial arts technique seems to fit it even earlier in the series. As the Turtles would eventually display advanced telepathic communication skills with Splinter in TMNT Adventures #17, I figure this story should come well before that one. *This issue also contained bonus pin-ups by Bob Fingerman, Bill Fitts and Michael Gaydos. This is the one issue I actually own. I'm very fond of it and its stories.